OnlineMapSearch Toolbar is the PUP that uses misleading techniques to prevent removal. Use Reimage to locate malicious components and get rid of them faster than with uninstall instructions. A full system scan blocks virus reappearance and prevents traffic to malicious domains. 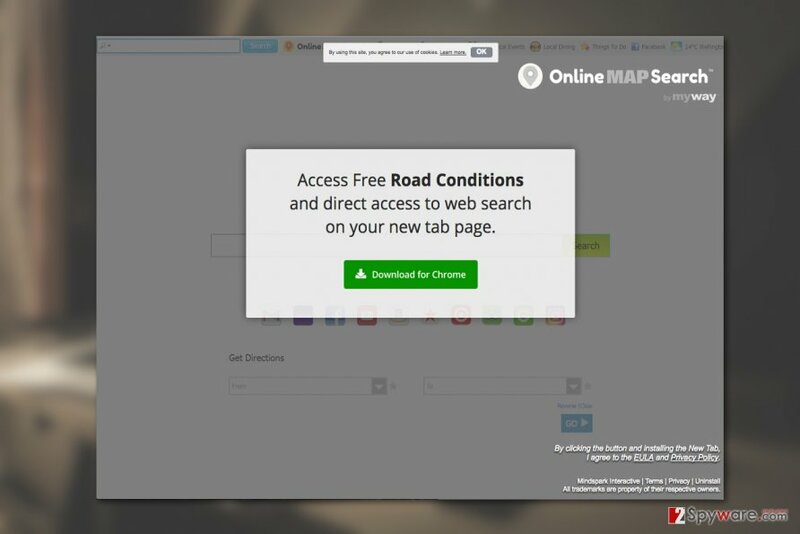 OnlineMapSearch Toolbar is another shady navigation software offered by a technology company Mindspark Interactive Inc. The program may not be a virus itself, but due to its uncalled-for activity on the computer, it can easily be regarded as such. While experts deem the software as a potentially unwanted program , users don’t hesitate to call it a malware and are actively looking for OnlineMapSearch Toolbar removal suggestions. We’ve made a little research to find out what is the reason users question the program’s trustworthiness. First of all, the program appears on the PC without asking user’s permission to install. It travels bundled inside software packages and usually accompanies popular freeware and shareware applications, such as PDF converters, media streaming or editing software, etc. After stealthy installation, the program will immediately infiltrate the web browser and pin its toolbar to the top of the browser window. This browser helper object will offer quick links to traffic maps, local events, local dining and a bunch of other features. Besides, Online Map Search has the word “search” in its title not accidentally. The software indeed provides web search service and includes the quick search box on the toolbar as well. But that is not what concerns users the most. In the picture above your can see OnlineMapSearch Toolbar download page. Users can’t help but notice the unauthorized replacement of the default search engine and homepage. The toolbar automatically switches the default browser domain to hp.myway.com and configures the browser to open it in the new browser window and the new tab. It is a behavior similar to what browser hijackers manifest on infected computers. The search service this site provides is highly questionable as it is more oriented in prioritizing sponsored content  rather than the content that is actually relevant. Maybe it is a way the company monetizes its products, but you do not have to take part in this business if you don’t want to. You can remove OnlineMapSearch Toolbar from your PC using Reimage or similar antivirus software, as long as the tool you are using is legitimate and updated to the latest version. Official OnlineMapSearch Toolbar download page can be easily found, but direct downloads is not the main vector of the software distribution. This program more often reaches computers after users install them along with freeware or shareware programs. Installing software via Advanced or Custom settings and opting out the installation of unfamiliar programs, for instance, OnlineMapSearch Toolbar. Recently, the developer of this program contacted us asking us to remove this post from 2-spyware.com website. We believe that we shouldn't do that as long as programs that we offer for the removal of OnlineMapSearch Toolbar can detect it and help users to remove it from the system. As it is mentioned under each of download buttons, we ARE affiliated with these anti-malware programs, and while some of them are free, others can remove a virus only after purchasing them. These mentions fully fulfill each of the requirements of FTC. In the tutorial below this article, we include manual OnlineMapSearch Toolbar removal instructions in case you wish to eliminate the virus from your PC manually. Keep in mind that the extension and all the related components also have to go. Delete them from the browser extension list manually and then reset the browser. Manual PUP elimination is not too difficult, but you will remove OnlineMapSearch Toolbar virus faster if you incorporate automatic tools in the process. The professional software will scan your PC in minutes, and it won’t be long until you will be able to use your PC normally again. Remove OnlineMapSearch Toolbar virus from your PC manually following the instructions below. Here, look for OnlineMapSearch Toolbar or any other recently installed suspicious programs. Wait until you see Applications folder and look for OnlineMapSearch Toolbar or any other suspicious programs on it. Now right click on every of such entries and select Move to Trash. When in the new window, check Delete personal settings and select Reset again to complete OnlineMapSearch Toolbar removal. Once these steps are finished, OnlineMapSearch Toolbar should be removed from your Microsoft Edge browser. Here, select OnlineMapSearch Toolbar and other questionable plugins. Click Remove to delete these entries. Now you will see Reset Firefox to its default state message with Reset Firefox button. 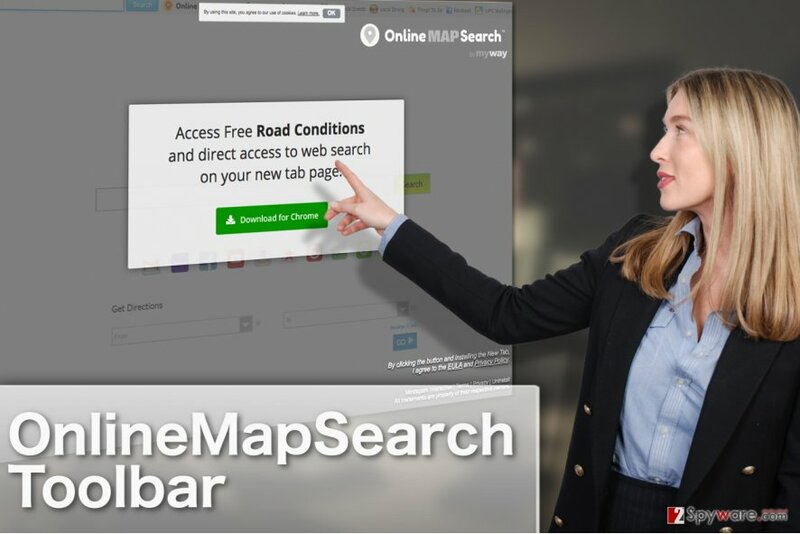 Click this button for several times and complete OnlineMapSearch Toolbar removal. Here, select OnlineMapSearch Toolbar and other malicious plugins and select trash icon to delete these entries. Click Reset to confirm this action and complete OnlineMapSearch Toolbar removal. Here, select Extensions and look for OnlineMapSearch Toolbar or other suspicious entries. Click on the Uninstall button to get rid each of them. Here, look at the Homepage field. If it was altered by OnlineMapSearch Toolbar, remove unwanted link and enter the one that you want to use for your searches. Remember to include the "http://" before typing in the address of the page. Now you will see a detailed dialog window filled with reset options. All of those options are usually checked, but you can specify which of them you want to reset. Click the Reset button to complete OnlineMapSearch Toolbar removal process. ^ Joe Lazauskas. Ask a content strategist: What’s the difference between sponsored content and native advertising?. Contently. Content Marketing News & Analysis. This entry was posted on 2017-07-05 at 05:49 and is filed under Stealing programs, Viruses. You can quickly scan the QR code with your mobile device and have OnlineMapSearch Toolbar manual removal instructions right in your pocket. How did you remove OnlineMapSearch Toolbar?